Archive for the ‘Public Inquiry’ Category. As you may know, Tesco lost the first Public Inquiry, which saw an independent government inspector uphold the decision of local Councillors to refuse planning permission on sound planning grounds. Tesco have just pulled out of the Public Inquiry for their other planning application (which was also refused), because they obviously think they would lose that too. Tesco say they can open without any further planning permission. They can’t. Even if they used refrigeration units that required no external plant (which is what they are talking about), they’d still need air conditioning which would require external plant, and so would need planning approval. This just puts them back to square one of the planning process. If Tesco could open a store without any further planning permission, why haven’t they done it already? Last summer, they went to all the trouble and expense of making a planning application just for refrigeration and air conditioning. When they lost that, they went to the even greater trouble and expense of spending several months preparing for a public inquiry (which they have backed out of because they obviously think they would lose that too). Now they say that they can open exactly the same store without any permission at all. If that were really true, they would never have spent 9 months trying to get their equipment approved, when all this time they could have been trading. Every time Tesco lose here, they try to spin it as a success by saying they are about to open anyway. They’ve been doing this for a year now, and they still haven’t managed to open a store on Mill Road. When Tesco reapply for planning permission for air conditioning, won’t such a small application automatically be approved? No, because they will have most of same problems that caused them to lose all their previous planning applications and the first inquiry. That’s because approval of the application would be necessary for the store to open. This means approving the application would cause them to start making deliveries, and they still plan to make deliveries in exactly the type of lorry that councillors and the planning inspector decided could not deliver safely to this site. Can’t they just use smaller delivery vehicles? They told the public inquiry that it would not be possible to run a store using only smaller vehicles. This is one of the reasons their appeal was turned down. Tesco say the store would create 25 new jobs. It won’t. It won’t even create the 20 extra jobs they were suggesting a year ago. A Tesco Express here wouldn’t create extra jobs in the area. It would replace existing, full-time jobs, in the stores they put out of business, with part-time jobs. (Almost all jobs in Express stores are part-time, with only a couple of full-time posts). The evidence from other towns tells us that the opening of a Tesco Express on Mill Road would force the closure of some of the existing shops, putting people out of work. If a Tesco Express opens, it is likely to take far more full-time jobs away from the area than it would create. It’s not clear where Tesco have got the figure of 25 from anyway. In the original plans, they said that they didn’t know how many people they would need to employ. Then they said that the store with an extension would create 20 jobs. Now they are saying that a store without the extension will create 25 jobs. So, they are saying that a much smaller store will need more people working in it. This doesn’t seem very likely, but it looks like useful spin in the middle of a recession. Won’t a Tesco Express be cheaper than existing shops on Mill Road? No, it will be more expensive. That’s because it doesn’t sell any of the Tesco Value range or have any of the cheaper product lines of the bigger Tesco stores. A shopping basket comparison between a Tesco Express and a larger Tesco in Dorset in November found that the Express was 19% more expensive than the larger Tesco. A comparison we did last year showed that the prices in the Cherry Hinton Tesco Express were 26% higher than in the Newmarket Road Tesco. At the same time, we compared prices in the Cherry Hinton Tesco Express with prices in existing shops on Mill Road (Londis, Hilarys, the Co-op, Bangla Bazar, Yasrab and Balvs). The Mill Road shops were 11% cheaper than the Tesco Express. Unfortunately, they are unlikely to have that choice. The evidence from all over the country is that the opening of a Tesco Express puts existing, independent shops out of business. The House of Commons All-Party Small Shops Group Report says that the closure of independent stores where the big supermarket chains open convenience stores is “inevitable”. A Tesco Express is likely to force the closure of several existing shops on Mill Road. If people chose to shop at a Tesco and other shops eventually close wouldn’t that just be fair competition? No. Small, local independent retailers in an area like Mill Road inevitably struggle to compete with a company as powerful and aggressive as Tesco, however good they are. Supermarket giants like Tesco use a variety of means to draw customers away from other shops – some legal, some not. For example, Tesco and the other big supermarkets have enough economic power to enable them to sell staple goods at a loss as a way of drawing in new customers (‘loss leaders’). Their wealth also enables them to run short-term voucher schemes in new stores, offering huge discounts until the viability of rival shops is threatened. Then the prices go up again. Obviously, local independent shops don’t have the resources to run similar schemes. Less legally, Tesco was also one of four supermarkets involved in a cartel with dairy companies to fix the prices of milk, butter and cheese, according to the Office of Fair Trading last year. This isn’t the only ruling relating to Tesco’s anti-competitive practices the last couple of years: in September 2007, the Competition Commission found that Tesco had acted to block competition in Slough. Fair competition requires something like a level playing field, not a situation where one player has the wealth and the determination to force everyone else off the pitch. STOP PRESS: Tesco withdraw their second appeal! 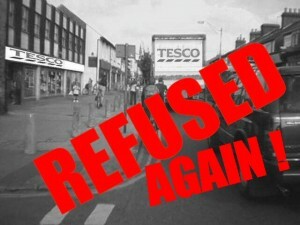 We have just heard from the City Council planning department that Tesco have withdrawn their appeal. Category: Public Inquiry | Comments Off on STOP PRESS: Tesco withdraw their second appeal! I would like to make a brief statement explaining to the inquiry the reason for the existence of the No Mill Road Tesco campaign, before handing over to my colleague Dr Deyermond, who will cover the campaign’s planning objections to Tesco’s applications. After all, as a Planning Inspector you visit many towns, making decisions in accordance with national and local planning policy. For someone representing Tesco, this is simply another relatively small store in another street in another town. Next week, no doubt, there will be another case involving another store in another street in another town. For us, though, this is our town, and our community, and we think it is worth fighting for. The Public Inquiry forced by Tesco’s appeal to the Planning Inspectorate will start on Tues 30 September 10am, at the Guildhall Council Chamber, Market Square. It’s very important as many people as possible come along to show the strength of local feeling. Please be there by 9.45am. The Campaign will be speaking, but anyone else wishing to speak (the more the better) may inform the Planning Inspector then, and you can say if you do not wish to be questioned by the lawyers present. The atmosphere should be non-confrontational. The Inquiry is scheduled to continue on Wednesday 1st and Thursday 2nd October. You do not need to be there all the time, or every day – just for the 10am start on Tuesday 30th September and stay for as long as you can.